VIDEO: Wearing a suit doesn't have to mean a boring 9-5 | The Gentleman's Journal | The latest in style and grooming, food and drink, business, lifestyle, culture, sports, restaurants, nightlife, travel and power. British round-the-world sailor Alex Thomson has unveiled yet another awesome stunt. Having established himself as a daredevil of the sport of sailing, this latest stunt involves Thomson, on a kiteboard, chasing his IMOCA open 60 HUGO BOSS boat upwind and attaching himself via a rope to the top of the boat’s mast. The skipper then utilises the speed of the race boat to propel himself 280ft into the air, sending him surfing above the vast yacht. 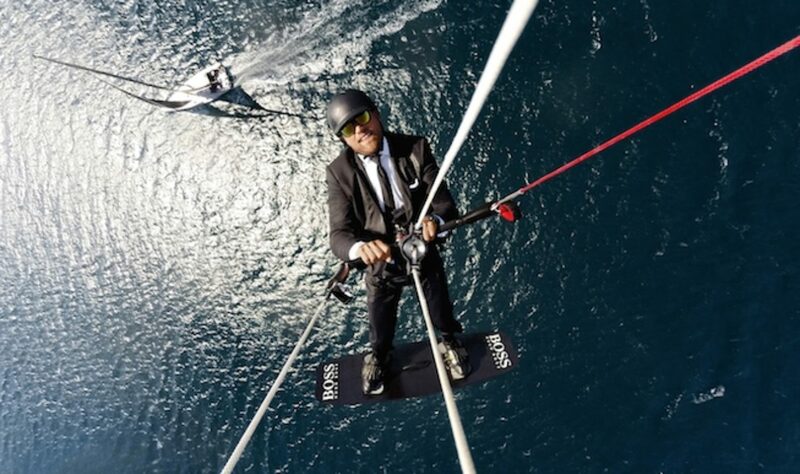 When Thomson reaches the peak of his flight, he detaches himself from the boat and expertly controls his descent back down, landing the kiteboard on the water in true Alex Thomson style, all while wearing a suit.